Tim Cook is a fan of augmented reality (AR). Revelation that is not, but the Apple CEO has waxed some more on why he's a proponent of AR, and how he sees it improving our lives. "I see AR as being profound," Cook said on the company's first quarter earnings call on Thursday. "AR has the ability to amplify human performance instead of isolating humans. So I am a huge, huge believer in AR. We put a lot of energy on AR. We're moving very fast." Cook was responding to an analyst's question as to whether he sees Apple eventually providing an ecosystem of AR-enabled devices beyond the iPhone and iPad. Unsurprisingly, Cook didn't talk about specific device plans, but his response shows that Apple is very much focused on augmented reality, and actively supporting its development. Cook pointed to the speed at which ARKit has leaped from version 1.0 to 1.5, and noted he "couldn't be happier with the rate and pace of the developer community, how fast they're developing these things." ARKit is the developer framework Apple introduced in iOS 11 that allows any iPhone and iPad to transform into an augmented reality machine. But the Apple CEO wouldn't go so far as to reveal or even tease what the company's plans are for AR devices, saying, "I don't want to say what we may do, but I could not be happier with how things are going right now." What we can glean from Cook is that the company will continue supporting ARKit and AR features for the iPhone and iPad into the foreseeable future. We'll likely see more AR tricks introduced in future iPhones, such as the iPhone X2, and more AR apps and games for all iOS devices come to the fore. These, as Cook suggests, could amplify our performance, at least by allowing users to continue interacting with the real world while augmenting what they see with useful and time-saving information. One ARKit app already available that demonstrates this potential is Ikea Place, which lets users place true-to-scale furniture in their home to see what it looks like before purchasing. We may not turn into superhumans overnight (not yet, anyway), but we can become more efficient thanks to AR. As for what Apple may have planned in the next few years, it's long been rumored that the company is developing a pair of augmented reality glasses. These Apple AR glasses could reportedly launch in 2020, and while hires and patents have pointed to their development, there's no concrete evidence the glasses exist yet (though they probably do). 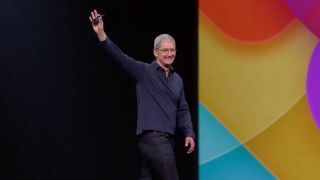 Cook's unwavering attitude towards AR at least supports the notion of AR glasses. He has spoken previously about how he thinks AR will eventually be as commonplace as "eating three meals a day". He explained in early 2017 that he prefers AR over VR because it "allows individuals to be present in the world but hopefully allows an improvement on what's happening presently," and compared AR to "a big idea, like the smartphone." So, don't expect a VR headset akin to the Oculus Rift or HTC Vive from Apple anytime soon. In the meantime, look for more AR apps and games coming to your iPhone and iPad. It may be some time before we see a dedicated Apple AR device, but the forecast is making one's appearance seem ever more likely.